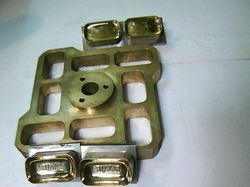 Prominent & Leading Manufacturer from Mumbai, we offer banded soap mould. We are instrumental in providing our customers a quality assured array of Banded Soap Mould. These moulds are manufactured keeping in mind the current market developments and advanced technology. Our skilled professionals manufacture the soap moulds on large scale utilizing steel moulds and accessories. They are easy to install and manufacture. Furthermore, our customers can avail this array at very nominal rates. Looking for “Banded Soap Mould”?